This article is about the television series. For the reggae song, see Murder She Wrote (song). 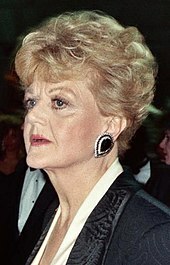 Series producers Peter S. Fischer, Richard Levinson and William Link thought Lansbury would be perfect for the part of Jessica Fletcher but did not think that she would be interested in a television series. Earlier, she had acted in two film adaptations of Agatha Christie's mystery novels: as Salome Otterbourne in Death on the Nile and as Miss Marple in The Mirror Crack'd (1980). When the latter film did poorly—despite an all star cast including Rock Hudson, Elizabeth Taylor, Kim Novak, and Tony Curtis—the offer for Lansbury to reprise Miss Marple in three more films never materialized. When the network released its schedule for the 1995–96 season, it decided to go in a different direction for its Sunday night lineup and placed two sitcoms, the top 30 hit Cybill and the new Almost Perfect, into the longtime home of Murder, She Wrote. CBS then put the series in its lead position on Thursday nights, anchoring a lineup that included the new drama New York News and the newsmagazine 48 Hours. Angela Lansbury as Jessica Fletcher (1984–1996; 264 episodes), a retired English teacher who, after being widowed in her early 50s, becomes a very successful mystery writer. Ron Masak as Sheriff Mort Metzger (1988–1996; 38 episodes), a former NYPD officer who takes Tupper's place as sheriff in the mistaken belief that he would be living in a more peaceful place. His unseen wife, Adele, a former Marine capable of prodigious acts of strength, teaches self-defense classes. In an earlier episode, Masak portrayed a different character, a store owner in trouble with the IRS, trying to get out of trouble by selling his business. He also portrayed a police officer investigating the murder of an author in another season one episode. Madlyn Rhue as Jean O'Neil (1993–1996; 4 episodes), the local disabled librarian in Cabot Cove. Keith Michell as Dennis Stanton (1988–1993; 9 episodes), a suave English former jewel thief turned insurance claims investigator, who always solves his cases using unusual methods, and often sends a copy of the story to Jessica afterwards. Stanton's assistant, Rhoda, who appeared in most or all of the Stanton-related episodes, was played by Hallie Todd. Many of the episodes starring Dennis do not involve Jessica, and usually begin with her introducing the story to the audience, breaking the fourth wall. Herb Edelman as Artie Gelber (1984–1995, 10 episodes), a NYPD Lieutenant and Jessica's friend. The Third Season episode of Murder, She Wrote entitled "Magnum on Ice" concludes a crossover that began on the Seventh Season Magnum, P.I. episode "Novel Connection". In the episode's plot, Jessica comes to Hawaii to investigate an attempt to murder Robin Masters' guests, and then tries to clear Magnum when he's accused of killing the hitman. The Magnum, P.I. episode originally aired on 11/19/86 with the concluding Murder, She Wrote episode following four days later on 11/23/86. The Magnum, P.I. episode of the crossover is included on the Murder, She Wrote Season 3 DVD set, as well as the Complete Series Set. The Magnum, P.I. Season 7 DVD set, as well as its Complete Series set, includes the Murder, She Wrote episode. Over its twelve-year run Murder, She Wrote received numerous award nominations. Lansbury herself holds the record for the most Emmy nominations for outstanding lead actress in a drama series with twelve, one for each season. She never won, which is also a record. Mary Dodson, the art director for 102 of the series' 264 episodes, received three Emmy nominations for her work on Murder, She Wrote. Deadline Hollywood reported in October 2013 that NBC was planning a reboot of the series, starring Oscar-winning actress Octavia Spencer as a "hospital administrator and amateur sleuth who self-publishes her first mystery novel." ^ Silden, Isobel (August 17, 1989). "It's No Crime When Yesterday's Stars Get Into 'Murder'". Los Angeles Times. Retrieved October 20, 2010. ^ Weinstein, Steve (May 21, 1994). "Television: After 10 years and more than 200 corpses, no one has been able to knock off 'Murder, She Wrote,' powered by you-know-who". Los Angeles Times. Retrieved October 20, 2010. ^ Haithman, Diane (October 20, 1990). "TV: The grind of a weekly hour series is too much, but a half-hour show is something else". Los Angeles Times. Retrieved October 20, 2010. ^ Harmetz, Aljean (October 27, 1985). "Angela Lansbury's unlikely sleuth has staying power". The New York Times. Retrieved August 20, 2010. ^ Weinraub, Bernard (December 1, 1991). "TELEVISION; Angela Lansbury Has a Hit. She Wants Respect". The New York Times. Retrieved August 20, 2010. ^ "TV Ratings Archive – 1988/1989". USA Today Weekly. September 25, 1988. Retrieved February 16, 2016. ^ "E3 2009: Murder, She Wrote game coming to the PC", news.bigdownload.com, June 8, 2009; retrieved January 14, 2010. ^ "First screenshots of Murder, She Wrote". Murdershewrotegame.com. November 17, 2011. Retrieved May 14, 2012. ^ "A break, she needed, from Murder She Wrote". The Hamilton Spectator. May 24, 2013. Retrieved September 14, 2016. ^ "Movies Keep `Murder, She Wrote' Alive". Chicago Tribune. August 5, 1997. Retrieved October 20, 2010. ^ "'Murder, She Wrote' Angela Lansbury Return". Entertainment Weekly. May 13, 2011. Retrieved February 22, 2012. ^ Bobbin, Jay (July 17, 2015). "Angela Lansbury thinks reviving Jessica Fletcher 'would be a downer'". Zap2it.com. Retrieved August 10, 2016. ^ McCreesh, Louise (August 8, 2017). "Murder, She Rewrote? – Angela Lansbury wants Murder, She Wrote to return for one final special". digitalspy.com. Retrieved September 7, 2017. ^ Barnes, Mike (February 21, 2016). "Mary Weaver Dodson, Art Director on 'Murder, She Wrote', Dies at 83". The Hollywood Reporter. Retrieved March 13, 2016. ^ a b Du Brow, Rick (September 13, 1991). "Television: Angela Lansbury is miffed that her top-rated series, a CBS bulwark, is routinely ignored at Emmy time: 'The industry is barely aware the show exists.'". The Los Angeles Times. Retrieved October 20, 2010. ^ "TV Ratings: 1984–85". Classictvhits.com. Retrieved May 14, 2012. ^ "TV Ratings: 1985–86". Classictvhits.com. Retrieved May 14, 2012. ^ "TV Ratings: 1986–87". Classictvhits.com. Retrieved May 14, 2012. ^ "TV Ratings: 1987–88". Classictvhits.com. July 26, 2002. Retrieved May 14, 2012. ^ "TV Ratings: 1988–89". Classictvhits.com. Retrieved May 14, 2012. ^ "TV Ratings: 1989–90". Classictvhits.com. Retrieved May 14, 2012. ^ "TV Ratings: 1990–91". Classictvhits.com. Retrieved May 14, 2012. ^ "TV Ratings: 1991–92". Classictvhits.com. Retrieved May 14, 2012. ^ "TV Ratings: 1992–93". Classictvhits.com. Retrieved May 14, 2012. ^ "TV Ratings: 1994–95". Classictvhits.com. Retrieved May 14, 2012. ^ "TV Ratings: 1995–96". fbibler.chez.com. Retrieved May 14, 2012. ^ Andreeva, Nellie (October 24, 2013). "NBC To Reboot 'Murder, She Wrote' With Octavia Spencer Starring, Alex Cunningham Writing And David Janollari Producing". Deadline.com. Retrieved October 26, 2013. ^ "Angela Lansbury is not happy with 'Murder, She Wrote' remake". Los Angeles Times. November 11, 2013. ^ Andreeva, Nellie (January 21, 2014). "NBC's 'Murder She Wrote' Reboot Not Going Forward, Could Be Revisited In The Future". Deadline Hollywood. Retrieved January 21, 2014. ^ In Italian, the "yellow genre" expression is equivalent to crime fiction from the 1930s when an Italian publisher, Arnoldo Mondadori Editore, published a series of crime fiction books using a yellow cover. ^ "Legacygames.com" (Press release). Legacy Interactive. December 18, 2009. Archived from the original on March 29, 2012. Retrieved May 14, 2012.